Muddy Waters was inarguably one of the greatest and most influential blues musicians who ever lived. Often referred to as the “father of modern Chicago blues”, he took Delta blues and added amplified electric guitars – often backed with electric bass and drums – to create a new sound by arranging everything into a band format. An unrivaled singer of blues and a remarkable songwriter, his recordings and live performances proved to be immensely influential on a number of genres, including rhythm and blues, rock ‘n’ roll, hard rock, jazz, and even folk. 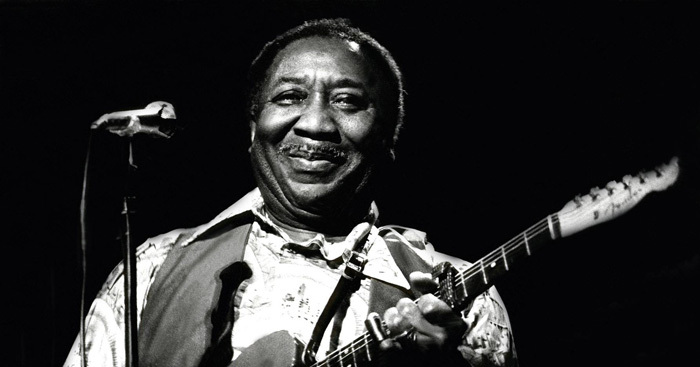 Born “McKinley Morganfield” in Rolling Fork, Mississippi in 1915, he was raised by his grandmother after his mother died shortly following his birth. His nickname came from his childhood habit of mud play on the plantations. Waters developed an early interest in music and started playing harmonica in his early teens. He took up guitar at the age of seventeen and honed his skills under the apprenticeship of famed bluesmen on the southern circuit. His most important mentor was Son House, who taught him about the basics of blues singing, open tunings, and slide guitar. Muddy Waters started playing guitar at the age of seventeen and made the acquaintance of several famous blues guitarists on the southern circuit within a few years. He relocated to Chicago in 1943 and became a major part of the city’s blues scene with his loud, crude and brash electric sound. His brilliant verbal imagery, sensual lyrics and frantic bottleneck slide guitar work produced hits such as “I’m Your Hoochie Coochie Man”, “I Just Want to Make Love to You”, “I’m Ready”, “Got My Mojo Working”, and “Rollin’ Stone”. Waters is widely credited as the link between the gritty acoustic blues of Robert Johnson and the British rock scene of the 1960s and beyond. He took Delta blues and intensified it by cranking up the volume with electric guitars and amplifiers, while turning it into a band orchestration. Among those who were influenced by his guitar work were Jimi Hendrix, Keith Richards, John Lennon, Jimmy Page, John Lennon, Johnny Winter, Buddy Guy, and countless others. His thick voice and firm, appealing personality defined showmanship techniques of blues. After going through a roller coaster of career ups and downs, Muddy finally got the recognition he truly deserved in the late 1970s. He drew a whole new generation of fans after his legendary performances at the Newport Jazz Festival and ChicagoFest. His health began to deteriorate in the early 1980s. Waters died aged 70 from heart failure at his Westmont residence in 1983. His funeral service funeral at Restvale Cemetery was attended by various prominent musicians and thousands of his grief-stricken fans. Muddy Waters earned numerous awards and accolades in his lifetime, and has been posthumously awarded many more. A few of them include six Grammys, five Blues Foundation Awards, and the Grammy Lifetime Achievement Award. He has been inducted into the Rock and Roll Hall of Fame (1987), and into the Blues Hall of Fame (1980). Muddy Waters was married three times: to Mabel Berry (1932–1935), Geneva Morganfield (1940–1973), and Marva Jean Brooks (1979–1983). He had at least five children.